I’ve been obsessed with cormorants for several years now, ever since I wrote my interdisciplinary master’s thesis on the seabirds. My studies took me all over North America, to four other continents, and almost to bankruptcy court trying to fund all the travel and research. Now, aside from the occasional boat trip to observe a local rookery, my involvement is limited to a Google news alert set to the keyword “cormorant.” Nearly every morning I get a link to a newspaper or magazine article by or regarding someone, somewhere in North America, arguing bitterly about what to do with the bird. The conservancy works with a local marine-science educational group called Project Oceanology, which for the last four years or so has landed instructors and students on South Dumpling to test various cormorant deterrents. They’ve tried anti-erosion mats, snow fences, and nets draped over the trees. 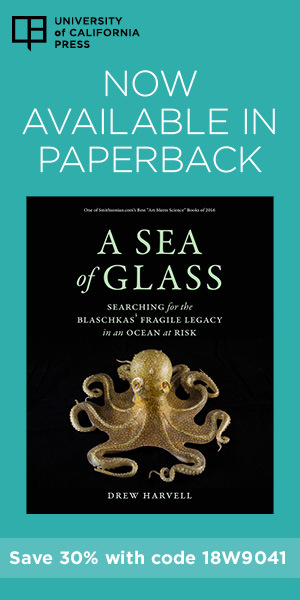 Their actions are backed, informally, by at least one local commercial fisherman, who approves of any measure to reduce the number of cormorants in Long Island Sound because he blames the birds for a drop in bluefish and flounder stocks. Sign, photographed in 2001, was posted in Henderson Harbor, New York, on Lake Ontario, where anti-cormorant sentiment runs high. Many anglers blame the birds for declining smallmouth bass numbers. In 1998, local charter fishermen illegally killed some 2,000 cormorants on nearby Little Galloo Island. Throughout the United States and Canada, pockets of citizens want to reduce cormorant populations they deem overabundant, for the same reasons: destruction of vegetation, unfair competition with more-valued species, and overindulgence in fish. Occasionally, there are claims that cormorants negatively affect water quality or public health, or just that their guano smells nasty. But the most vehement complaints are about fish—primarily from freshwater charter fishermen and fish farmers. In 1998, a bunch of charter fishermen turned vigilantes stormed onto Little Galloo Island in eastern Lake Ontario, trampling and shooting about 2,000 cormorants in violation of federal law. (It’s a crime to kill migratory birds without a permit.) They were eventually brought to justice, but another group that killed more than 500 cormorants two years later on Little Charity Island in Saginaw Bay, Michigan, never was. So great was the public outcry against the birds that the U.S. 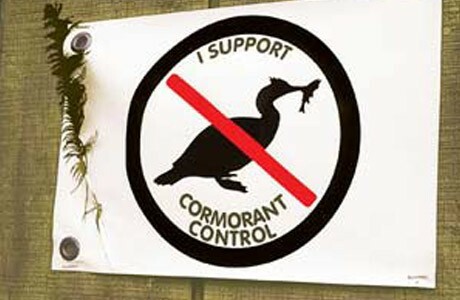 Fish and Wildlife Service (USFWS) felt compelled to draft a new cormorant management plan. During the grueling, multiyear analysis and public-comment period that followed, many voices pushed for stringent management to reduce cormorant numbers. Some wanted to establish hunting seasons—even though nobody eats cormorants. Others, including the National Audubon Society and the Humane Society of the United States, rallied to the cormorants’ defense, citing a lack of scientific evidence that cormorants actually damage fish or wildlife populations. In 2003, the USFWS settled on expanding the rights of citizens and managers to deal with cormorants, handing over most of the decision making to selected local agencies. (The service took a similar route in 2006 to tighten management of burgeoning Canada geese, the only birds that provoke anywhere near as much irritation as cormorants for their fouling of lawns and parks.) Today, in thirteen states, aquaculture producers may shoot cormorants feeding on their private ponds, and they may call on government wildlife managers to shoot birds on nearby roosts. Local managers in twenty-four states can suffocate cormorant eggs with oil; destroy their nests; or kill cormorants that threaten public resources, such as wild fish, plants, and other birds’ nesting areas. 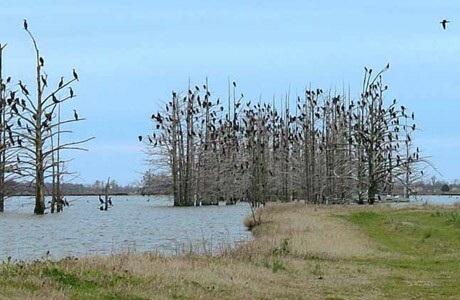 Cormorants can be seen roosting overnight in a cypress break in the Mississippi Delta. One of the most common harassment techniques being used against cormorants is roost dispersal. Photo courtesy of James Steeby, Associate Professor, Extension Aquaculture Specialist, National Warmwater Aquaculture Center, Mississippi State University. Depending on your chosen taxonomy, there are between twenty-seven and thirty-eight extant species of cormorants, all closely related to pelicans, frigate birds, and anhingas. They live around the globe in colonies bordering salt- and freshwater. 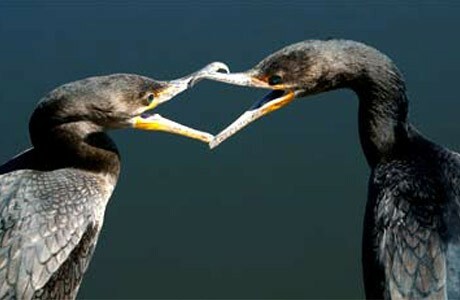 As a group, cormorants primarily eat fish, but will also eat crustaceans, mollusks, and small amphibians. Most species prefer to hunt in coastal shallows, but many can dive more than 100 feet underwater. (The Crozet shag of the Southern Ocean has been recorded at the impressive depth of 475 feet.) Using their beaks to gather sticks, seaweed, fishing line, ribbons, and other random items, cormorants build their nests in trees, or on rocks, dirt, or sand. 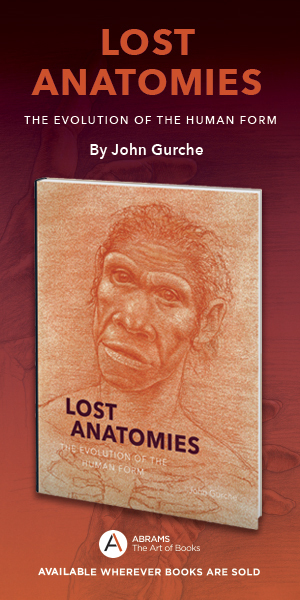 The adults have no song or call, only a hiss or a piggy grunt, something like the creak of an old door hinge. The young in the nest issue a shrill, high-pitched cry for food. Today, six species of cormorants live in North America. 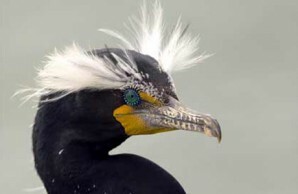 By far the most prevalent in the U.S., and the only one found appreciably inland, is the double-crested cormorant, which gets its name from two tufts of feathers that appear on the heads of both sexes during breeding season. Double-crested cormorants nest in forty-three states, every Canadian province, Cuba, and the Bahamas. During migrations or winter roosting they spend time in every state except Hawaii. They travel as far north as Alaska and Labrador and as far south as the Yucatan Peninsula.